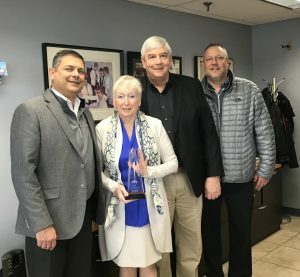 In a ceremony prior the start of its April 25, 2018, sale, Columbus Fair Auto Auction (CFAA) was awarded Ally Financial’s Auction of the Year Leadership Award for 2017. The award recognizes the auctions overall sales, performance, and growth for the year. This marks the third year in a row that CFAA has earned the award.